The loss meant that the Brazilians surrendered their lead at the summit to Orlando Pirates, who were held to a draw by Bloemfontein Celtic. 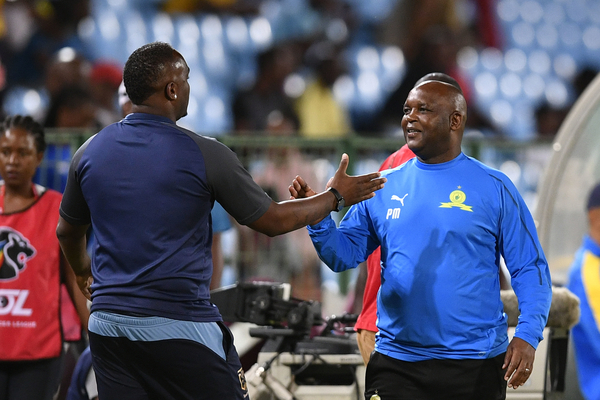 After going down 2-1 to Cape Town City in the Absa Premiership on Tuesday night, Mamelodi Sundowns coach Pitso Mosimane says his side did not deserve to be on the losing end. The loss meant that the Brazilians surrendered their lead at the summit to Orlando Pirates, who were held to a draw by Bloemfontein Celtic – the Buccaneers and Masandawana are tied on 40 points, while City are a point behind them. “It is so unfortunate and I never thought we would lose the game because we defended very well, even though we lost the game. I never saw us losing this game,” said Mosimane. “I am happy with my team. They play good quality football and it doesn’t mean when you play well you will win. We probably deserved a draw to be honest, we didn’t deserve to lose. There was never a problem,” Mosimane added. The former Bafana Bafana coach went on to praise Benni McCarthy and his team’s style of play. “It was an unbelievable game, it was a proper football game. I don’t see a lot of these in the PSL. I show big respect in Benni and his team, he has not been long in football, but he’s playing the right kind of football, what a good game.